I have a story about the turquoise drawer. On Monday of this week I posted a photo of this dresser makeover with the top drawer showing the original wood finish….not painted. I asked if you guys liked the drawer unpainted or wanted it painted. The reason I asked …..was because I couldn’t decide myself…and my husband said he thought I should paint it. Almost 50% of ya’ll agreed with my husband. Beth, this photo is for you. Also the photos on Monday’s post aren’t true to color. I usually prefer taking my photos outdoors but the weather has been really gloomy and the photo colors have been off. These are much more true to color. The paint color is turquoise. And of course I had to change out the knobs. They came from Hobby Lobby. My favorite place for new hardware. What do ya’ll think now? Incredible transformation! 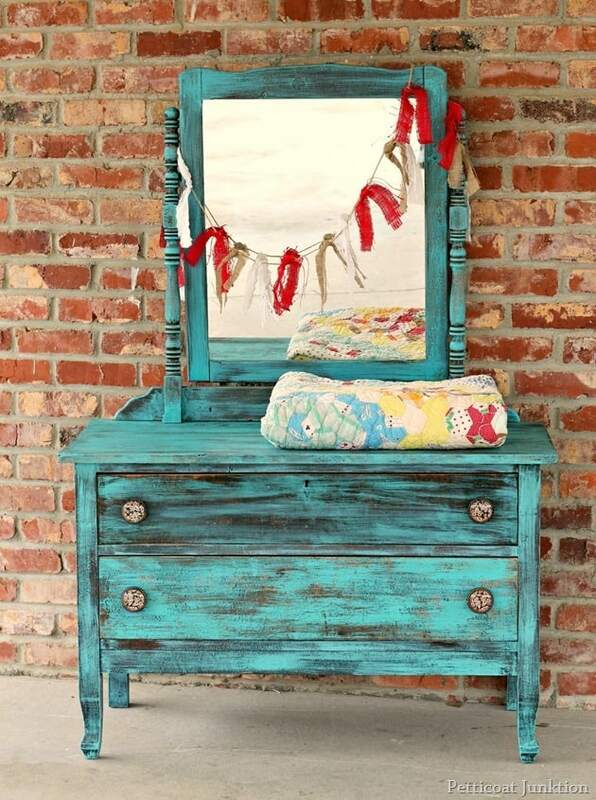 I love the turquoise and the distressing OMG! It’s really a beautiful piece. You’ve made it look like it cost a small fortune. I live in New Mexico and love this piece! 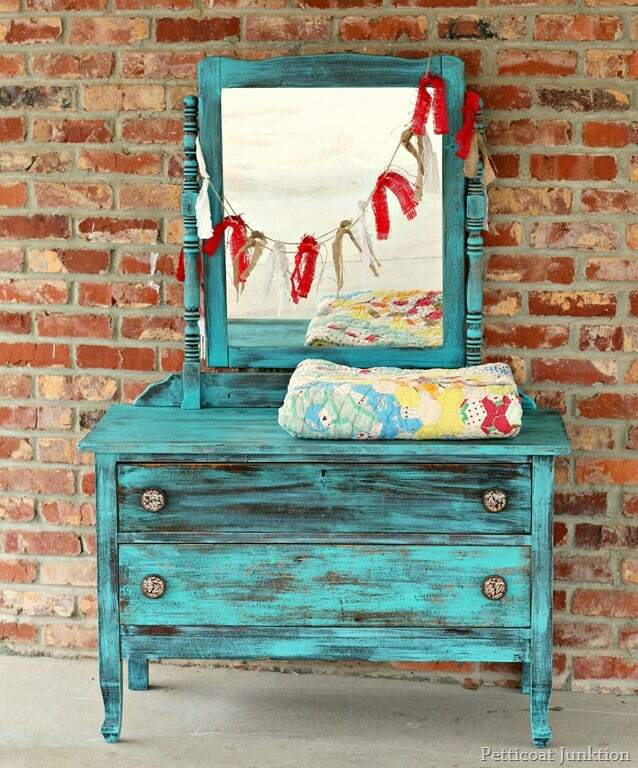 Of course, turquoise is a must and love the cute little garland hanging…it looks like a red chili ristra! So pretty. I love it styled with the quilt. I’m a sucker for turquoise and red together. I LOVE what you’ve done with this dresser. Oh pooh! I really liked the single dark drawer. Sorry you gave in. It’s a nice piece but the other was unique. I love this piece a lot. I am looking for something to paint this color. Love it and your blog. Both ways are cute but I think I like this one better, oh and these knobs really finish it off! I really like you married two different pieces of castoffs, just shows what a little hoarding and creative thinking can do! Liked it 2 tone – love it painted! I like it better now with that drawer painted, to me it flows better. Great job as always! 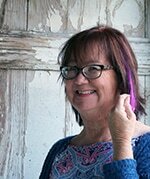 Hi, I like it in its funky form with the top drawer dark,but truly love it better now! 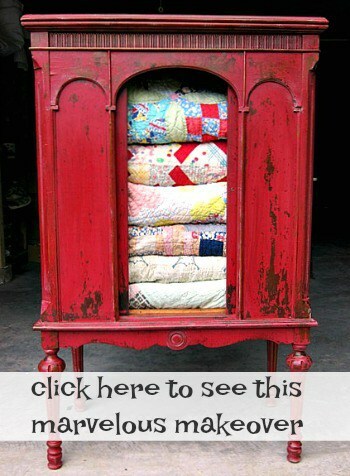 An inspiring project since we all come across pieces suffering from wear like this…..I have an old veneer 2-drawer file cabinetin bad shape….maybe it will endup turquoise! Thanks for sharing this!! Love the color. I would have preferred a little less distressing, however, what the market bears is what you do. I know how much you can fall in love with a piece, but customers always want something different. I loved that you styled the dresser with the quilt. I love this dresser! The color and distressing is perfect. 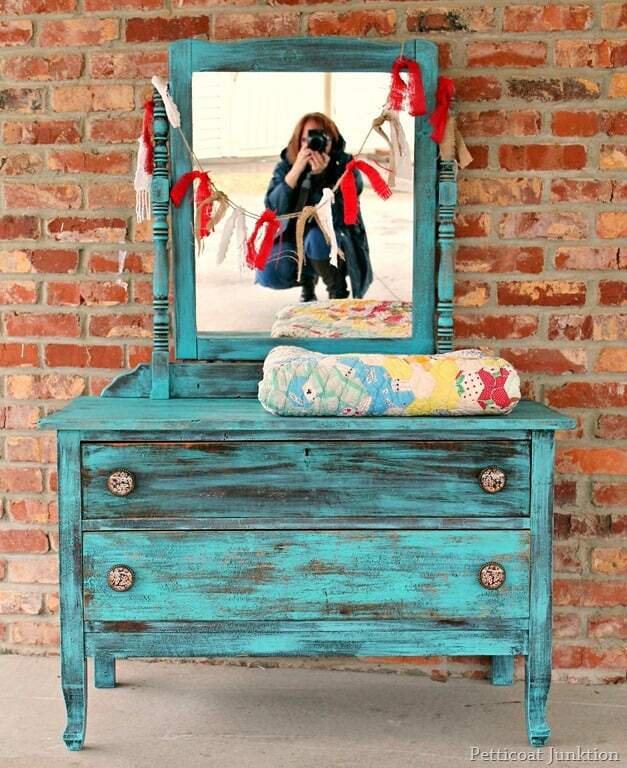 Turquoise is one of my favorites anyway and I have it throughout my own home. Perfect. Love those drawer knobs on it. I still can’t believe the transformation from the “before”!!! !